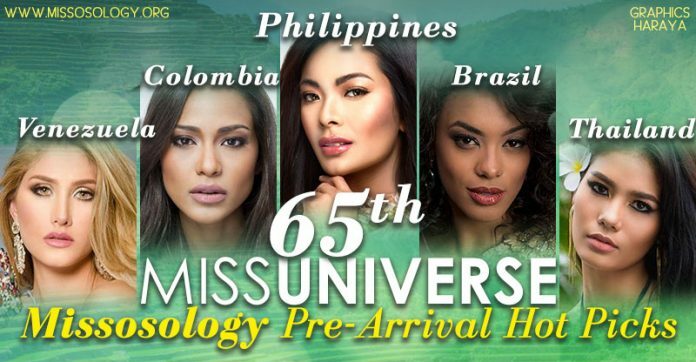 Hours from now, the first Miss Universe contestant, save from the host delegate, will land in Manila to compete in the 65th edition of the pageant. For the second time, Miss Universe technically skipped a year. The first one was in 2014 when the 63rd edition was actually held in January 25, 2015. Such “skipping” raises a question about the sustainability of the pageant but make no mistake in thinking that Miss Universe is in decline. In those two instances, Miss Universe was actually funded by the local hosts – by the City of Doral in 2014 and by a consortium of private companies for its “2016 edition”. Truly, Miss Universe is still a hot item so to speak and with the Philippines as the host nation, things will simply turn out fabulous as evidenced by the wonderful outcome of Miss Universe 1974 and Miss Universe 1994. Surely, the contestants will have all the fun in the world as they compete in a pageant crazy nation. The host delegate Maxine Medina is trained to show her country’s best foot forward. When 2016 concluded, there is a collective feeling in the Philippines that they were wronged. So now, the “collective feeling” is that they need to prove that they are indeed a superpower nation in world of pageantry. Back-to-back? Will the Philippines’ Maxine Medina win the Miss Universe crown in her home soil? A back-to-back win will put the Philippines in the same footing as Venezuela and there is a huge effort being undertaken right now to make sure that it will happen. It is nothing sinister like having host friendly judges in the panel of jury (like putting their national director as a judge for example). Rather such efforts are poured into Maxine through relentless training and conditioning. Latest photos and videos show a confident Maxine Medina with vavavoom body ready to unleash the fierce beauty queen within to take on the toughest competitor. Having the same perspective as the Philippines, Colombia, a country that has all the rights in the world to claim that they were wronged in 2015, have doubled, nay, tripled their efforts to secure the crown. Andrea Tovar – classy, elegant, confident – is completely the right delegate for the task. She is ready to put Colombia to where it belongs which is on the top. Sure, there was bad blood between the Philippines and Colombia post 2015 pageant. But things right now echo the antebellum years where the Philippines has nothing but respect and admiration to Colombian beauty queens. Remember in 1974, Colombia was just 3 ranks away from winning and in 1994, they almost triumphed. Andrea will thrive in the Philippines and that could serve as a springboard towards victory. Brazil is a county to watch. When Raissa Santana was crowned as Miss Brasil, the whole pageantry community went gaga over this black Barbie. Miss Universe is a huge deal in Brazil where the quest for their third crown is a relentless annual pursuit. Keep an eye on Raissa. She could truly be Brazil’s third Miss Universe titleholder! If everyone was awed when Raissa was crowned Miss Brasil, Mariam Habach’s victory at Miss Venezuela meanwhile left everyone scratching their heads. Some claim it will be the end of Venezuela’s golden era and like its economy, the country’s beauty pageant infrastructure is believed to be in tatters. But Osmel Sousa, Venezuela’s legendary queen maker, is not taking things as it is. Mariam Habach was transformed into a goddess and she will show off her wares in Manila. As what it was in 1994, Venezuela will once again command the respect and admiration of everyone during the Miss Universe competition. Thailand’s Chalita Suansane has been the darling of the press recently. She is a strong candidate and hopes are high that Thailand will be victorious this time around. The country has the momentum and there is a solid machinery that can back her up starting from equally pageant crazy fans to a well-funded and highly popular national organization. In many cases large and traditionally strong nations dominate the list of who’s who but coming from a small island does not deter Miss Barbados Shannon Harris from joining the big leagues. Her beauty has a universal appeal and we hope that her chances rests upon her inherent strength and not on the sash weight. Another strong delegate is Caris Tiivel of Australia. This large nation last won in 2004 and Caris is like a jolt of million megawatts that gave life to the erstwhile sagging campaign of Australia. It is also a nation that seeks its third crown with a well-funded pageantry machinery. Caris is no doubt well prepped for the competition and her sash commands a great attention. Miss USA Deshauna Barber is a candidate worthy of our attention. Don’t let her photos fool you. She is a drop dead gorgeous contestant up close and there is a feeling that it is the year of United States this time around. She’s very smart, very poised, with a very good rapport among fellow candidates and to the general public. After the Top 5 finish of Flora last year, France is putting a laser-like focus at Miss Universe. The country has been playing switcheroo with its first runner-up and winners for a while and this time, there is a steady pattern that the real winner of Miss France has to compete at Miss Universe. Iris Mittenaere, is the winner of Miss France and she is specially reserved at Miss Universe. If this is not an indication that France is dead serious in winning, then we don’t know what is this. Another country hunting for its third Miss Universe title is Mexico. The behemoth nation with passionate pageant followers is deploying a candidate who is familiar with the battle terrain. Kristal Silva is Mexico’s best hope to end the pageant year with a bang. She has been to the Philippines before competing in another major international pageant. She knows the people and the host nation well and she has left an indelible positive impression back in 2013.